This classic illuminated blue ocean globe is named in honor of famed explorer and navigator, Admiral Richard Byrd. 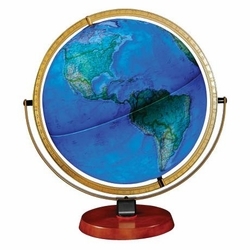 Add an educational touch to an office, children's room or classroom with this blue ocean illuminated globe designed with a vintage appeal in honor of adventurer Richard Byrd. A medium teak hardwood base has a steel yoke and a diecast meridian, built as sturdy as Admiral Byrd himself. Thousands of place names are highlighted with raised reliefs of topographic features. Tap the globe to activate 10 bright LED lights that add a new dimension to this fascinating model of our planet. • Illuminated blue ocean globe on stand. • Medium finish teak wood base. • 10-light LED array inside. • Takes four AA batteries (not included).